They say they do everything bigger in Texas but the birth of baby boy who weighed in at 16lbs 1oz (7.3kg) in the Lone Star State has made headlines worldwide. 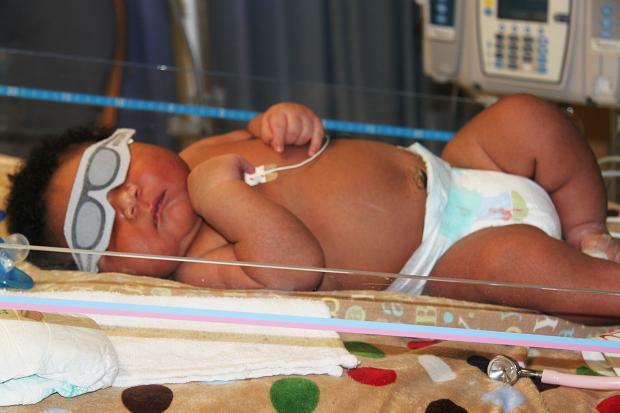 JaMichael Brown, who was delivered by Caesarean section on Friday, weighed more than twice as much as the average newborn American. He measured 24 inches long, just a few inches shy of the average one-year-old. He was delivered in the 39th week of pregnancy, just a few days early, and has already earned the nickname “Moose” on the internet. The boy’s father, Michael Brown, said that doctors had told him to expect a big baby “but when he pulled him out it was a different story”. Thank you for stopping by. The baby’s large size is though to be a result of his mother having gestational diabetes during her pregnancy. The condition causes a pregnant woman to become resistant to her body’s own insulin and to pass a higher than normal amount of sugar to her baby, who stores the extra calories as fat. Genetics may also play a part: his father is 6ft 6in and his uncle 6ft 8in. The heaviest newborn ever recorded weighed 23 pounds, 12 ounces and was born to an Ohio woman in 1879, according to Guinness World Records.